Unboxing underway for review! Initial box impressions: not bad. The decor is pretty good but using the I.Rex’s skin as background would suggest the new film is all about the new dinosaur (which of course, it was to some degree). Unlike the original jungle design of Series 1, which hinted at adventure in my opinion; or I’m just thinking too hard about it. Here’s the tail. It’s attached separately which I like. 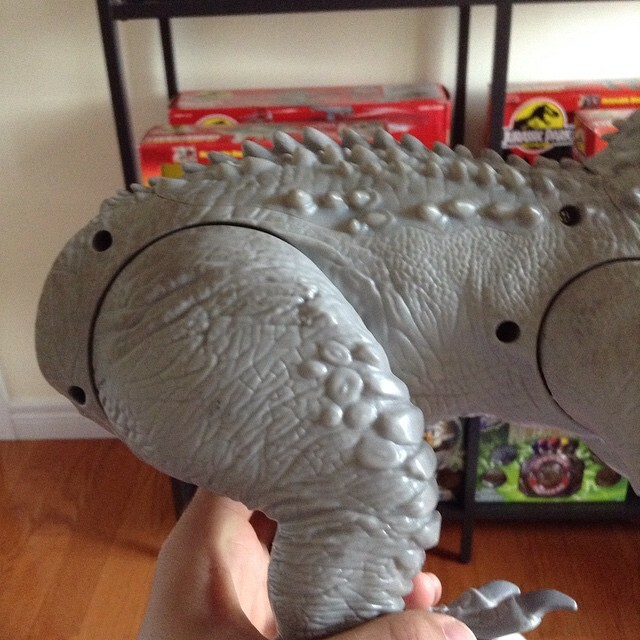 It avoids the bent tail problem of the old Kenner Rexes. It doesn’t articulate at all though. You’ll notice in the photo on the left a slight seam. That doesn’t bend. 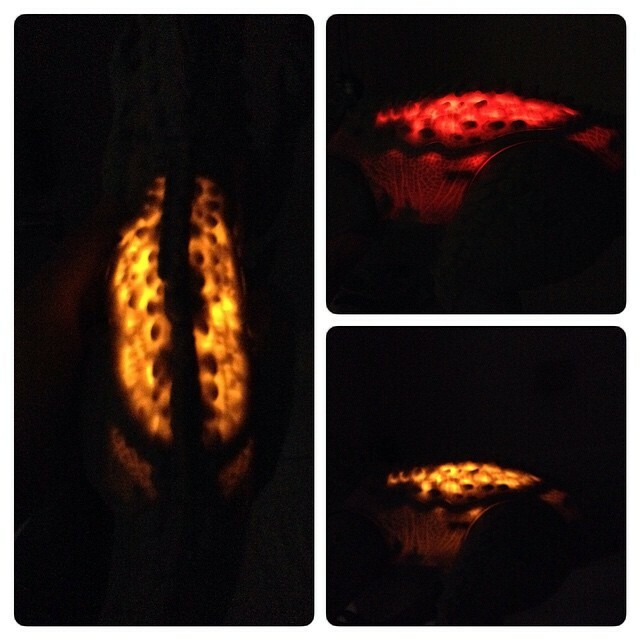 Also, if you look at the upper right photo, you can see smudging or what looks like it was rubbed in dirt. I wonder if other owners have that problem. Internal wiring is pretty standard. 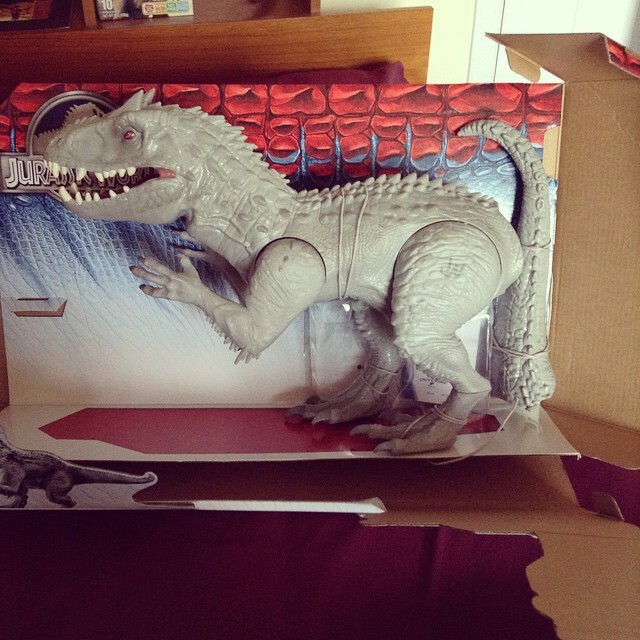 It makes me think back to unboxing my Red Rex back in ’93. 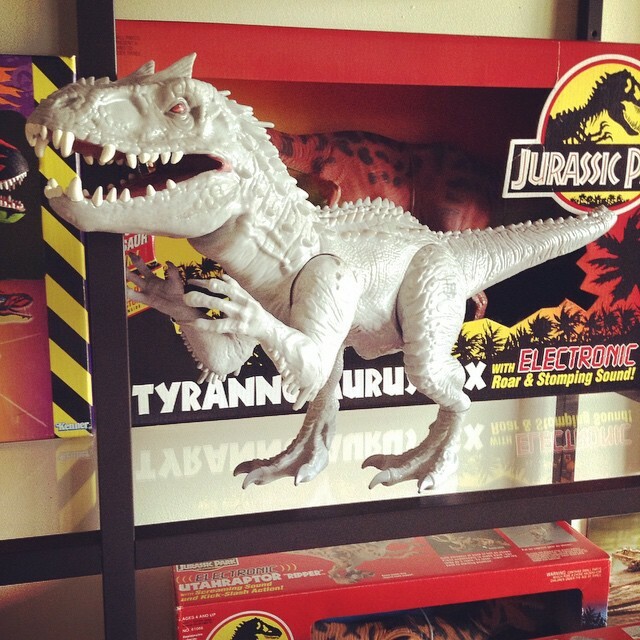 I used to put the wires in the Rex’s mouth and pretend they were the cables from fence in the movie. Did anyone else do that? Finally out of the box! It feels almost blasphemous looking at this…never again! 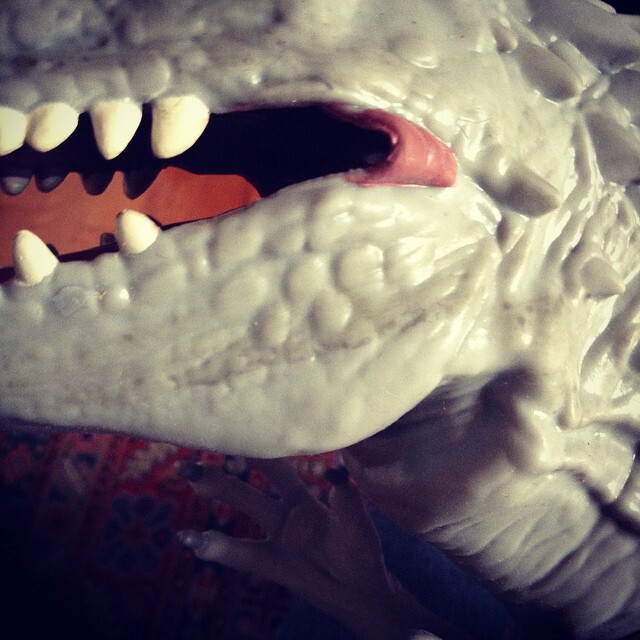 More dark marks on the lower jaw; not thrilled. 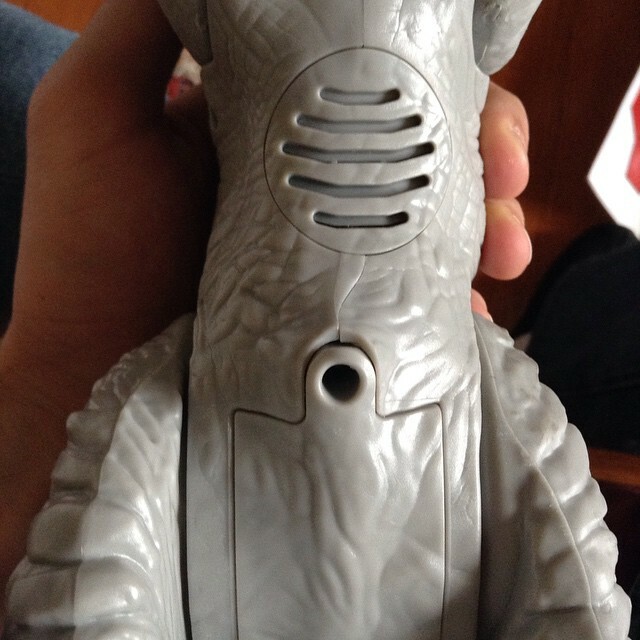 The head is mostly soft rubber. Very Kenner-esque in that regard. Lopsided feet, which is not cool. My Bull Rex had this problem as well but at least it could stand up. 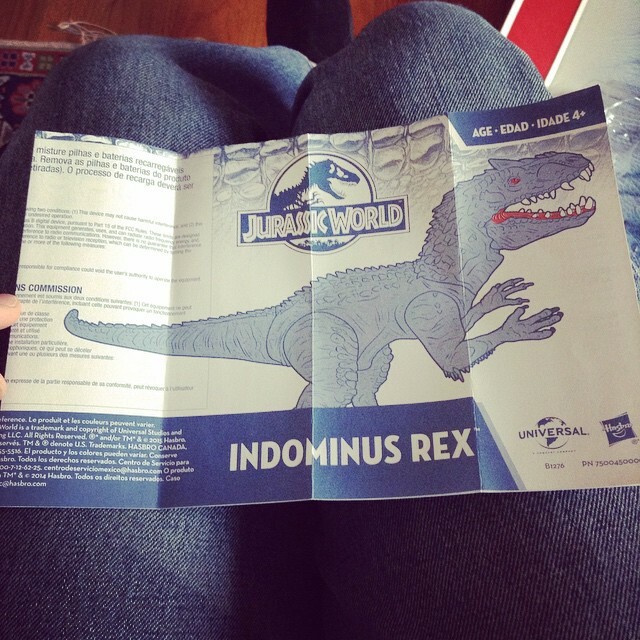 Indominus barely can, which I’ll touch on in a bit. 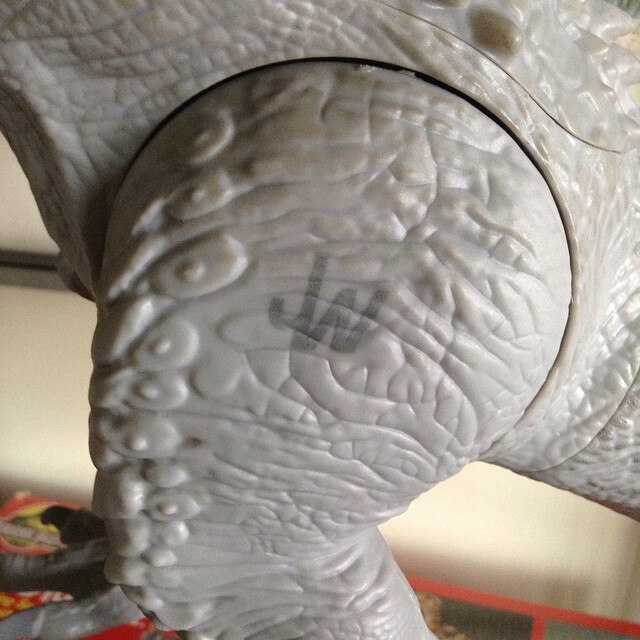 More smudging…geez Hasbro, did you give this guy a dirt bath before packaging him? I’m not impressed with the screw holes on the side like this. It takes away from the overall look. Unless you keep it facing left, you’re always going to be starting at those damn holes. The exposed seam isn’t too hot either. 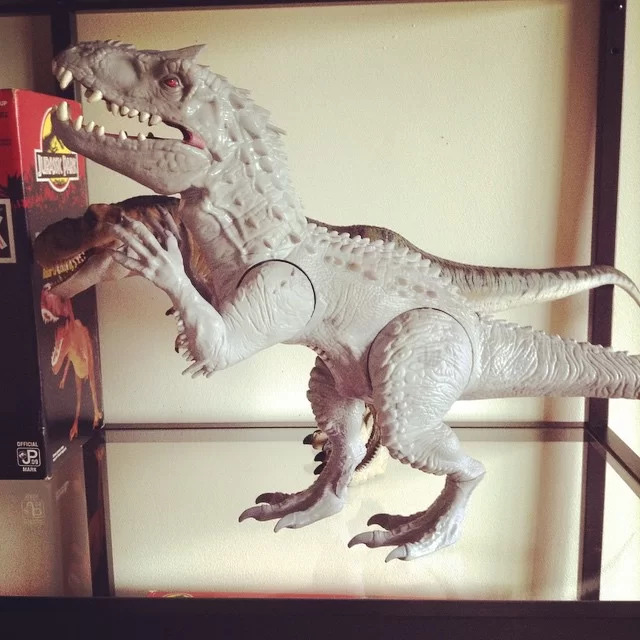 I feel like Hasbro really took some shortcuts with their design on this one, and I have no reason to think the other JW toys are any better. Something a bit more fun: the speaker and battery compartment. They’re tucked away nicely on the belly. The battery compartment is easy enough to open with the right screwdriver. Standard instruction manual. 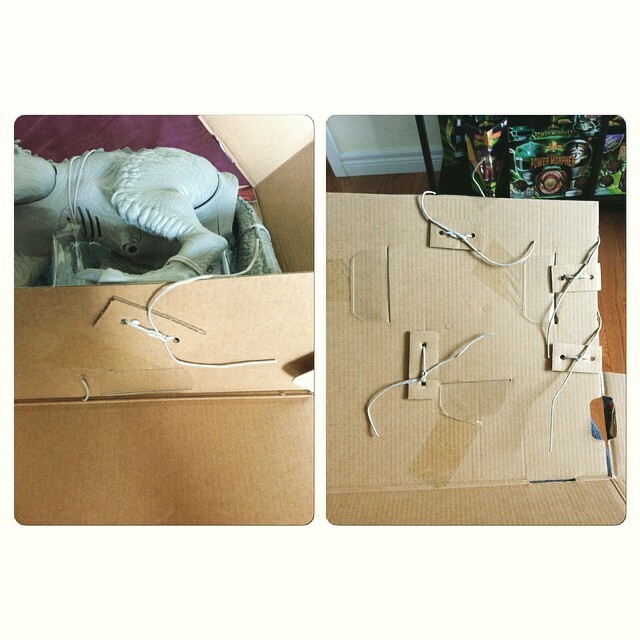 This toy is super easy to assemble so I doubt you’ll need it, but it’s there if you do. This is what the back looks like after installing the batteries and pulling down on the left arm. I must admit this is pretty awesome! You won’t see much though in a brightly-lot room. A little JW logo on the left leg. Definitely a nice homage to Kenner there. 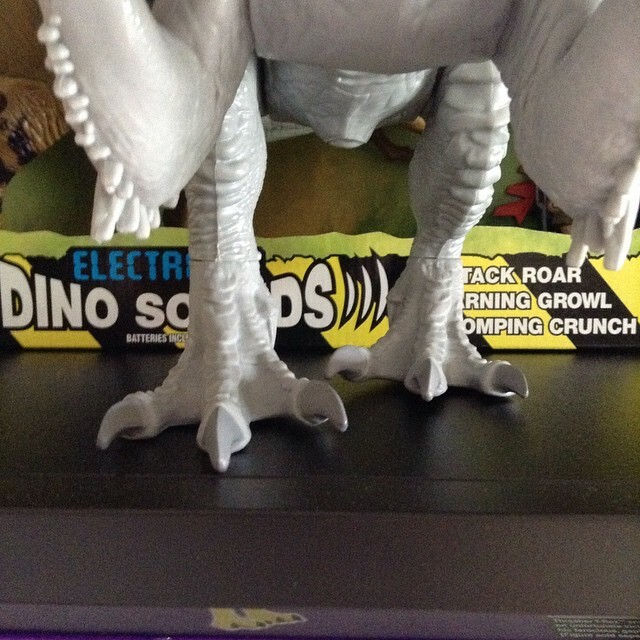 I had to compare it to the best Rex figure Kenner made! 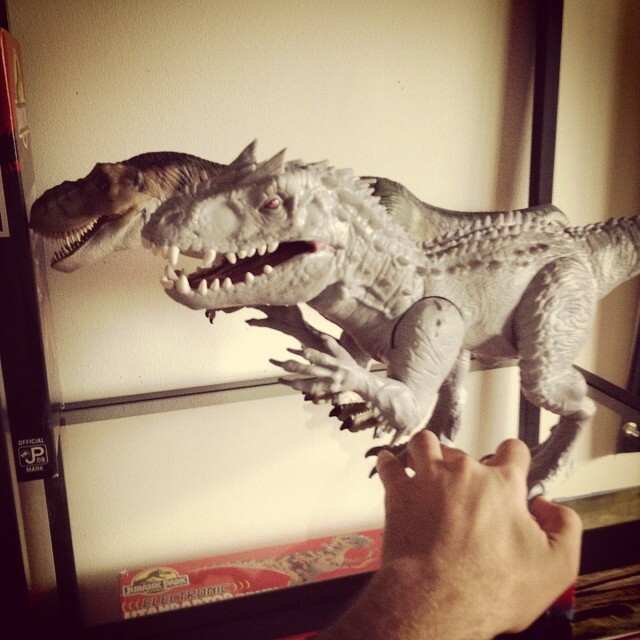 Size-wise, Indominus is roughly the same as Thrasher. But she’s WAY too top-heavy. The head and forelimbs are enormous and she can’t stand up without arching her back as seen here. The legs are also loose too, which don’t help matters. Putting them side-by-side really highlights the lousy paint job on Indominus. 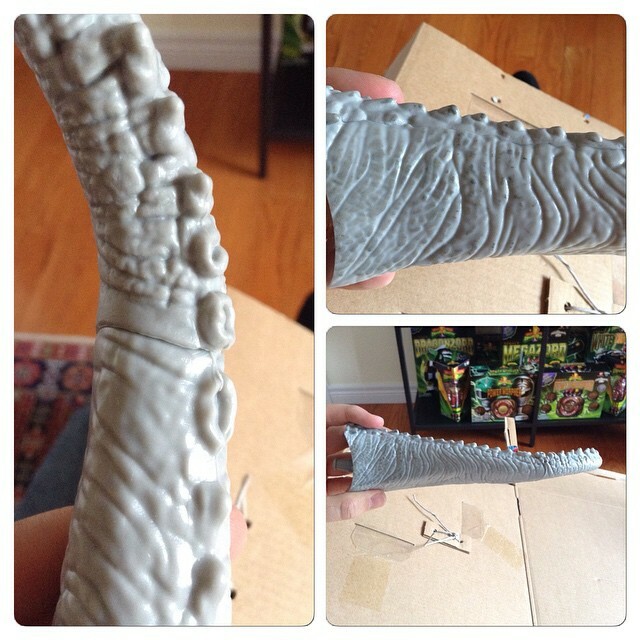 It looks like it was dipped in grayish, silver paint and then Hasbro called it a day. The only difference is in the eyes, which are painted red. That’s weird, considering they’re green in the film but I can let that slide. 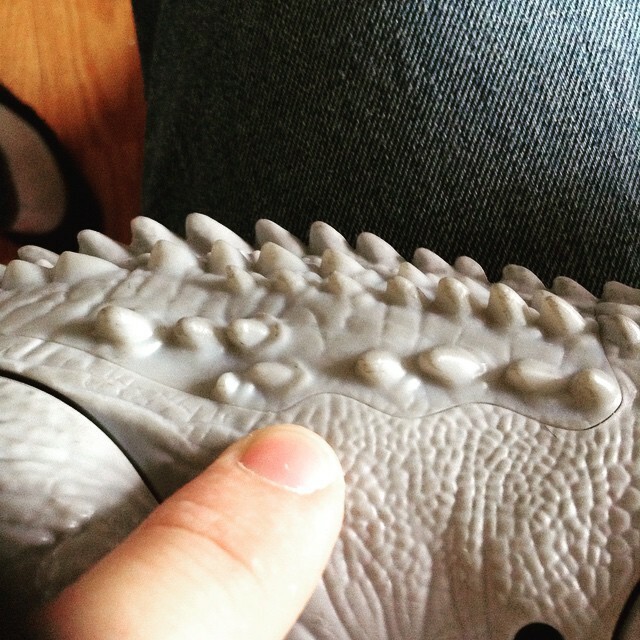 My final verdict: 7/10 for the Indominus Rex by Hasbro. The electronics are top notch but the bland paint job, poor balance, loose legs, and lopsided feet really bug me. The toy is overall pretty Kenner-esque but let’s face it, Kenner would’ve made something really spectacular, which is why I’ve posed him here in front of the Red Rex from Series 1. 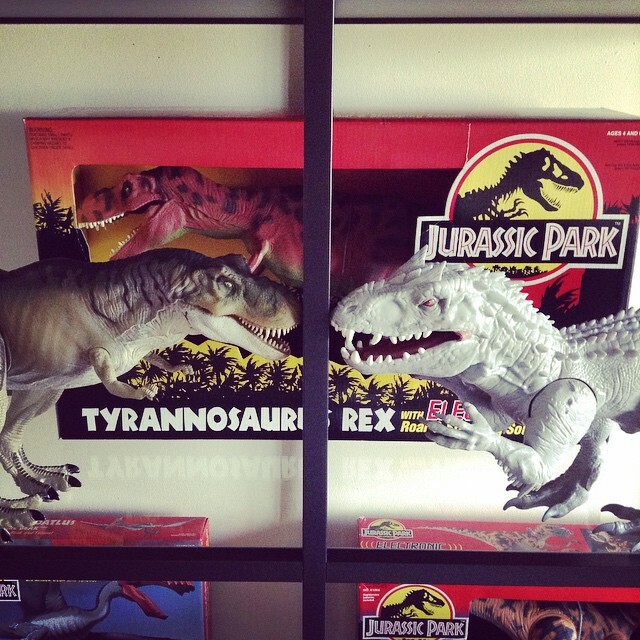 Try as Habro might, it will forever live in Kenner’s shadow when it comes to Jurassic Park toys. Thank you all for being here and I hope you like this unboxing and review! My Indominus Rex is not working. Do you have the instructive to see how it works? Me again. 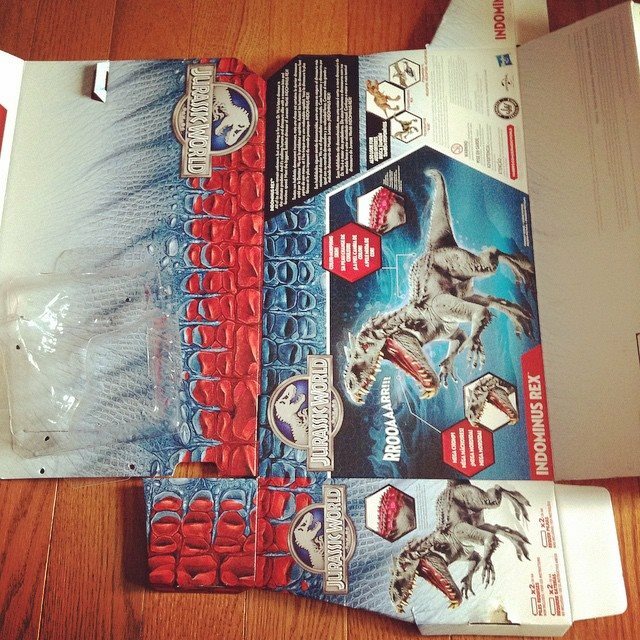 New pictures of the destroy n devour Indominus Rex! It looks amazing. 100% movie accurate. I am definitely trying to buy one when it becomes available in April. P.S. 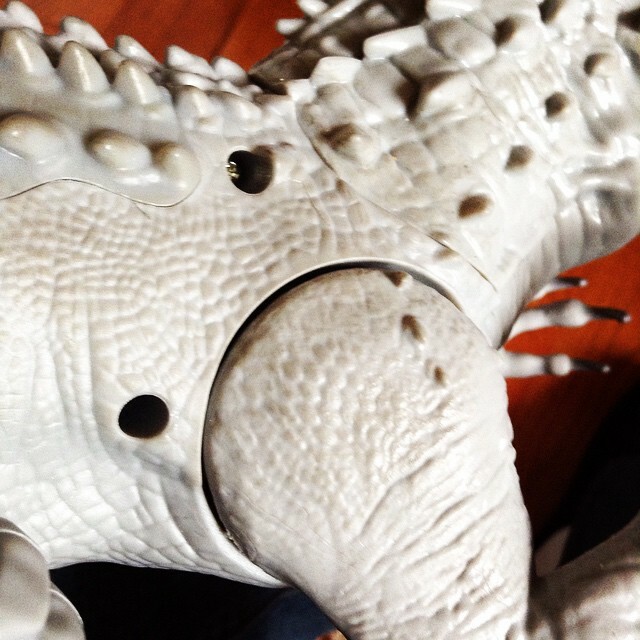 The Indominus’ eyes were more of an amber color.